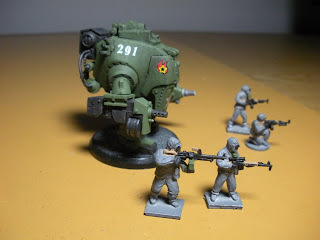 There are a lot of games that I don't play, but do buy the miniatures from. AT-43 is one of these games. 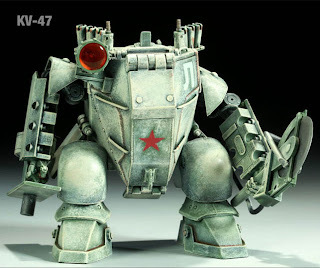 I became aware of the AT-43 miniatures because of Paolo Parente's involvement in some of the initial design work for Rackham. The similarities in designs are particularly obvious for the Red Blok faction, and the Soviets of the Dust Universe. The armored soldiers of the Red Blok use the Kolossus powered armor. I thought that these would work very well in 1/72 as larger powered armor suits. There are four major types of the Kolossus, three of which are shown below. I don't particularly like the RPG launcher with the rocket peeking out from the barrel of the launcher. I'll probably drill out the end of the barrel so that the launch tube resembles that of a nebelwerfer. Also, why have such a limited use weapon on this type of machine at all? The RPG Kolossus (with a pair of RPG launchers) is especially questionable, since it would be almost useless after it expended its four rounds. For some reason, the Dragomirov Kolossus units were very poorly assembled. I had models with arm joints that couldn't move, front plates that flopped around, and even one with a missing arm. I felt the red-brown color used on these units was atypical of Russian war machines, and more like German red oxide primer. There's a snarky part of me which suspects that the color was used so that there would be no confusion that they indeed were part of the Red Blok. Also, why are they marked "KOLOSSUS" and not "КОЛОСС?" Why label your armor this way at all? Were T-34s marked "T-34" on the side of their turrets? Anyway, here is my rendition of the Колосс with some partially finished modern Soviet NBC figures from Elhiem. I plan on using the non-com version of the Kolossus as the basis for all Gauss gun armed units. I took off the flamethrower from a Strielitz Kolossus, and replaced it with a Gauss gun. I painted the Kolossus green, and then went over it with a black wash. 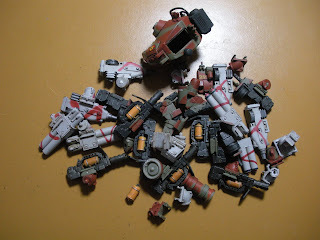 I used a white wash on the original decals to give them a slightly bleached look. Russian turret numbers from Archer were then applied to the sides of the hull. The size of the Kolossus also matches quite nicely with the Pro-Hobby Koubu from my previous entry. I can picture a WWWII scenario for the August Storm campaign involving Soviet powered armor against Japanese powered armor. Some of the pieces will make a good start as the basis for a KV-47 scratch build project, or this really cool conversion by Haibane. I think this will be my last post for the year. I don't know how other wargame bloggers manage to get so many entries written. I was aiming to make a post every two weeks, but struggled at times to write even one a month. However, I guess if you average my entries I did in fact exceed my goals. Now they are cool! They look great alongside the NBC troopers. Thanks Eric, this is a great idea. How easy is it to repaint the Kolossi? Also, what do you think of the Elheim Soviets? Do you have any pictures of them next to 1/72 scale figures? Hopefully the NBC troopers themselves will look as cool after they are painted, but I'm not so sure. The Russians went for a mint green outfit that makes them look like they are wearing hospital scrubs and white gas masks! 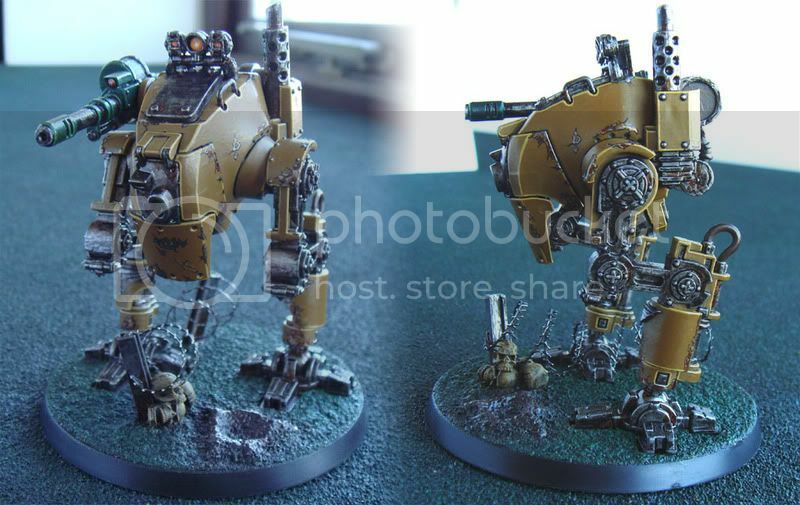 The Kolossus is not difficult to paint. I was initially thinking about airbrushing, but since I wanted to preserve some of the original markings, I painted by hand. The NBC suited Soviets are nice. They vary in size, with some being closer to the height of a 1/76 figure, but after a bit of thought, I imagine that the shorter figures could be female. After all, you can't really tell who is under that suit. I haven't taken any scale comparison pictures of them, but I think I can collect enough figures for a gasmask themed entry next year.